Not what you think of usually for coconut shrimp! 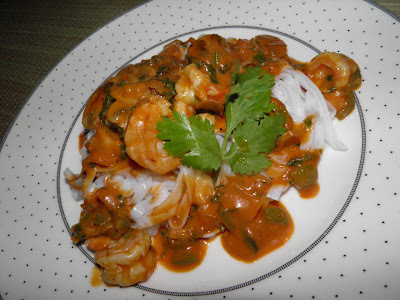 My recent foray into Caribbean kitchens got me think about tropical ingredients and how varied they can be. It's not difficult to think about tropical food – and drinks – when the temperature outside is minus 15°C. A favourite summer taste for many is coconut and rum, either flavoured (I should make some) or mixed in drinks like Pina Coladas. 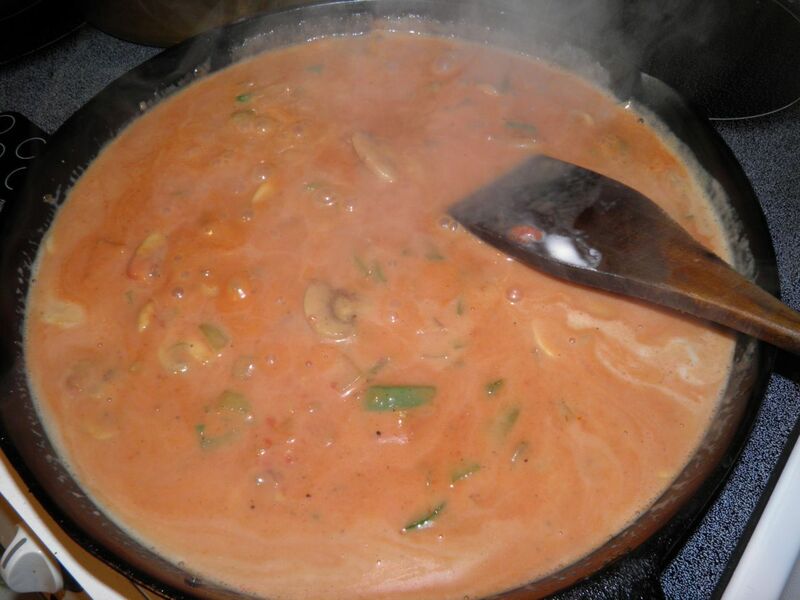 You can make a fantastic pasta sauce out of vodka. I wondered why not rum, with the right accompaniments – coconut being one. That was where my mind was when I started this. Two simple substitutions: rum for vodka, and coconut cream for regular cream. All one really had to do was figure out the right spices to bring it to the balmy Caribbean. Most likely candidate besides cilantro? Number four: Allspice. Allspice (Jamaica pepper, myrtle pepper, pimenta or newspice) is the dried unripe berries of Pimenta dioica, a small tree that grows in the Caribbean. The name came from the British, who thought it tasted like a combination of cinnamon, nutmeg, and cloves. This is allspice. Columbus first mistook it for pepper. Dried berries store longer than ground and are more aromatic when freshly ground – like every other spice. So buy the berries whole. The leaves can also be used for cooking, but loose their aroma when dried. Fresh leaves and bark are used to smoke meats. That's not something we need to worry about in Nova Scotia. Allspice is one of the most important ingredients of Caribbean cuisine. It is used in jerk seasoning, moles and in pickling spice mix. It's also an ingredient in many sausage seasonings and curry powders. In North America, it is used mostly in desserts and baking because of its resemblance to cinnamon, clove and nutmeg. This next little fact reminds me of a George Carlin joke. Allspice has also been used as a deodorant. Mr Carlin's joke was "if you ever run out of deodorant, put a bay leaf under each arm. It won't stop you from perspiring, but you'll smell like soup!" Indeed. I'm going to give you some friendly advice. It's always good to have a very varied spice cupboard. That way whatever you want to make you'll probably have the seasonings on hand already. There's nothing worse than falling in love with a recipe and then not having what you need on hand. But don't buy those glass jar spices from grocery stores. They're too expensive and they tend to get pushed to the back of your cupboard. You should see my mother's cupboard. A nightmare. Just buy what you would reasonably use in six months and put them in some cheap jars from the Dollarstore. Total cost is around $1.50 for the same amount you pay double that for from a grocery. That's what the Bulk Barn is for – buying just a little of some weird spice that you may only use once every three or four months. Here's another news you can use hint. Have a special place for your spices where you can see all of them – like a shallow shelf system on the back of a cupboard or pantry door. It only needs to be one jar deep. If you can see something, you're more likely to use it. I really liked this sauce with the seafood. None of the flavours were overpowering. It's a gentle sauce with interesting flavours. If anything I would dial up the allspice, and maybe add a few chilli flakes or a jalapeno for some heat. Other than that, all you need is a Pina Colada and a heat lamp. Just close your eyes, and sit back. Heat the oil in a wide sauté pan. Add the garlic and onions and cook for a few minutes. Then add the mushrooms and cook until they reduce down in size and some of their liquid has come out. Add the coconut cream, rum, tomato paste and green pepper. Let the mixture cook until the sauce coats the back of a spoon. 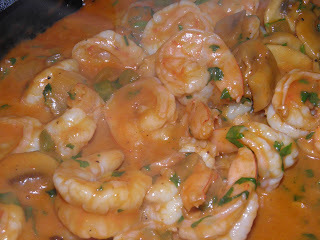 Add the shrimp, cilantro and allspice and cook just until the shrimp are no longer pink, about 4 minutes. Do not over cook them! Serve on wide rice stick vermicelli, or white rice.